Digital Influence is one of the hottest trends in social media and it is also one of the least understood. Klout, PeerIndex, Kred among many others are investing millions of dollars to understand how our social media activity translates into influence. The market for influence is only heating up with more entrants expected to debut and acquisitions or mergers likely on the horizon. Within the last 90 days alone, Klout took in a Series C of $30 million from Kleiner Perkins at a whopping valuation of $200 million. PeerIndex also recently announced an investment of $3 million. Whether we agree with them in principle or not, the topic of digital influence is only becoming more influential. Almost anyone with a social media profile is already indexed in at least one of the many vendors on the scene today. Consumers are trying to figure out what it means. Brands are realizing the promise of connecting to connected consumers. Advertising and PR agencies are spending budget against it. 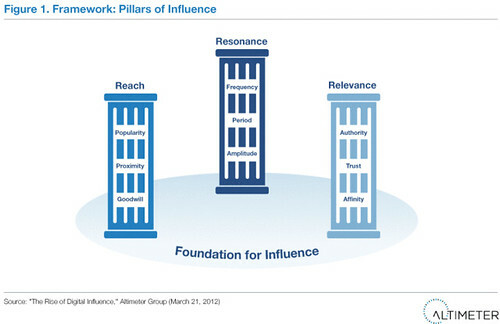 So what is influence and what does it really mean? Right now, there are more questions and theories than answers. Like some relationships in Facebook, it’s complicated. But, I can tell you what it is not. Influence is not popularity and popularity is not influence. It’s so much more than that. Early on in the development of the report, I learned that the definition of influence was elusive or in some cases, down right incorrect. At the same time, vendors claim to track influence when in fact, they track elements of online social capital based on proprietary algorithms of how people engage and connect in various social networks. While this isn’t influence per se, brands and those familiar with “influence” services now associate the idea of direct influence with scores, which is part of the problem. So, I set out to explore the landscape to help make sense of it. It’s not a scorecard of vendors. It’s not a rally against vendor positioning. It’s a call for clarity. It’s important to note that the report is actually a constructive “how to” guide for businesses to learn how to use tools such as Klout and PeerIndex to build productive relationships with connected individuals. The Rise of Digital Influence examines why “what” services track is useful and how to make it useful to your business as it relates to specific business objectives. The report shows how to use each tool to build an effective “influence” strategy…step by step. I think few would disagree that influence as a score is imprecise. But it is in this assertion that the responsibility of translating numbers into insights falls on those who expect to glean value from these services. Everything starts with the realization that none of the vendors out there actually measure influence. Instead, they measure a slice social capital, which is defined here as the online networks of relationships among people in a particular society, enabling that society to function effectively. After spending a significant amount of time with brand managers, advertising and communications professionals, and also connected consumers, it was clear that the “score” became the emphasis. Brands sought out people with higher scores. Users pursued ways to increase their scores. Services built programs that rewarded those with higher scores. But very little went into gaining better understanding of what the number actually meant for brands and consumers alike. Though very public experimentation however, brands are learning in real-time that scores do not matter as much as the context of relationships. Consumers are learning that gaming scores or being part of branded marketing activity without purpose may actually affect their status within their online communities. I believe that many look at the idea of influence backwards, unknowingly relying on scores rather than understanding how influence is actually created and used. Without context or defining purpose or value upfront, experimentation is already leading businesses down the wrong path of wasted time, resources, and squandered opportunities to build important relationships. And for users, they’re left without a strong grasp of how these scores affect them online and offline. An important question for businesses to consider is what does a score actually represent? What does a “74” mean to your business goals and objectives? And, how do you apply it toward effective strategies and supporting metrics? It turns out that a “74” means very little when viewed simply as a score. But that’s just common sense. However, each service provides a deeper view of individuals, why they’re scored in a particular way and most importantly the elements that contribute to contextualized social capital (focus, authority, the nature of relevant relationships, etc.) and how their online activity potentially reaches and affects others. Services such as Traackr, eCairn, and mBlast excel here. Here, value is in the eye of the beholder. The value is a result of research and how data is interpreted and applied against business objectives. So, in that sense, tools that measure online activity can provide value if you know what you’re trying to accomplish first and how you will measure success and then apply that filter to your examination. Once businesses take the time to learn about digital influence, its benefits, and how to connect with influential consumers, brands can harness social networks to proactively drive positive sentiment, engagement, and results. It’s important to take this time to gain a better grasp of digital influence to develop a meaningful strategy and defining desired outcomes. See, digital influence is defined as the ability to cause effect, change behavior, and drive measurable outcomes online. So a score of “74” doesn’t correlate directly to outcomes. But, through design, brands can identify the right people, develop meaningful engagement strategies, design online experiences that can lead to desirable results. · What is influence, and what makes someone influential? · Who is influential in social networks and why? · How can I recognize influence or the capacity to influence? · What effect does digital word of mouth have on my business? · How can I measure successful engagement with influential consumers? To help you find the answers and more importantly, to get the greatest value out of influence vendors, I include a detailed Influence Action Plan to develop thoughtful, results-oriented strategies and programs. The Action Plan is designed to walk you through the steps necessary to assess where you are, where you need to be, who can help you get there, why, and what’s in it for them and those who follow them. By studying the people who matter to your business, and the people who matter to your customers, your business strategies will benefit from a new level of customer awareness and sensitivity that speaks volumes in new media. Suddenly the score isn’t as important as the elements that earns someone stature within their community. Understanding this will contribute to a more informed, effective and valued engagement program. And at the end of the day, while “influence” vendors help identify ideal connected consumers, it is up to those who run influence marketing programs to define the “R” or return in ROI to track the true measure of influence, outcomes. 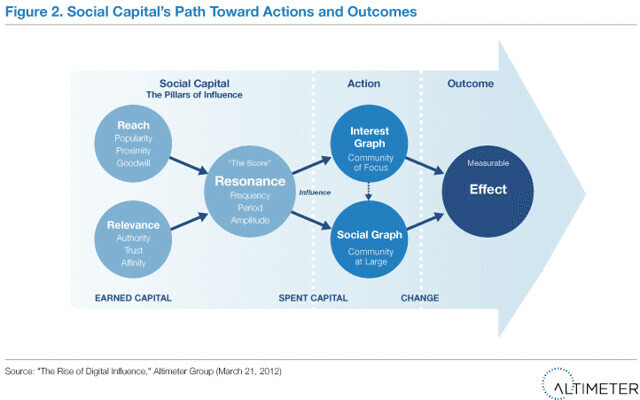 Referring to Figure 2, the relevance and the reach, obtaining those connections is the hardest step. What determines where we should start and who we need to be marketing to and with in order to get our products out there if we are just starting out. I still see no reference to the underlying problem with being scored in comparison to Justin Bieber. The problem of information overload and the limits of human attention are not being addressed by any of the tools you are referencing here. TunkRank, however has continually been referenced in articles and by computer scientists around the world for considering the limits of human attention no matter who is “influential” in their circles. TunkRank bases your influence score on how much attention your Twitter followers can actually give you and helps customers determine their twitter marketing strategies with our Influencer data. hi israel, thanks for this. i checked it out and – wow!!! – my sister-in-law belongs to my most influencing people. Great stuff Brian. Measuring true influence is much more complex than a number. Great info, Brian! Thank you!